The T+0 (zero) line shows the profit and loss of an Options Strategy on the current day across a range of different prices of the Underlying asset or commodity. This tells the trader whether the position will make or lose money if it was closed today. 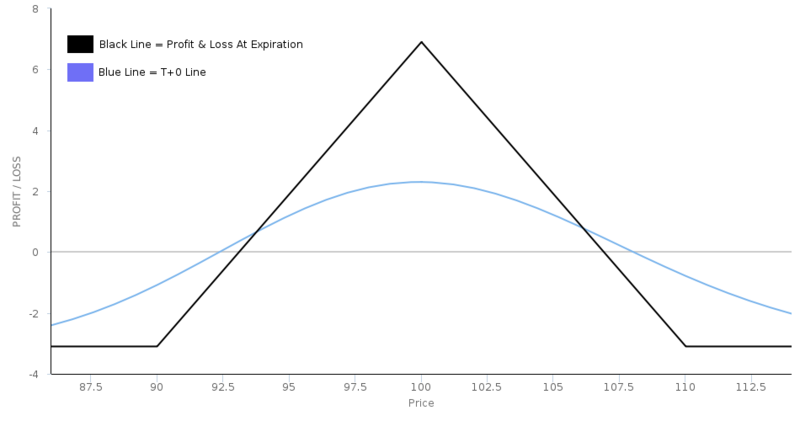 Depending on the duration of time remaining until Expiration, the T+0 line can be significantly different to the final profit and loss Payoff Diagram at Expiration. This is a function of the Extrinsic Value of Options (i.e. time remaining and Volatility of the Underlying). This means a trade may lose money on an Options position if they close it before expiry, even though if the price remained the same, the position would make money at Expiration. Similarly, some positions can be more profitable if closed prior to Expiration. The T+0 line will tend to fluctuate more as Expiration approaches. This is a visual representation of the effect of Gamma upon option pricing. Options analysis software or tools are used to plot an Options Payoff Diagram and these will also show the T+0 line and allow the trader to see the effects as time progresses.